Data Availability has become more and more important for today’s businesses. The NetApp Data ONTAP and Veeam combination provides a high Availability level for the Always-On Enterprise. By leveraging NetApp data protection features like snapshots, SnapMirror and SnapVault, Veeam is able to enhance recovery time and recovery point objectives, otherwise known as RTPO, for VMs and applications residing on NFS-, FC-, FCoE- and iSCSI-based arrays. Some enterprise data centers are leveraging NetApp’s ability to cascade ONTAP systems to maximize Availability. In this blogpost, I explain the benefits of leveraging an ONTAP cascaded design with Veeam. The requirements include using SnapVault between RLPEDGE01 and RLPEDGE02, combined with application-consistent snapshots. Furthermore, the customer wants to use SnapMirror to replicate the SnapVault data to RLPEDGE03, which is in a co-location facility. To build this configuration, NetApp ONTAP protection policies are combined with Veeam’s advanced storage integration and orchestration capabilities. Veeam creates an application-consistent backup of VMs. This includes the optional log truncation and snapshot creation within the VMware environment. Next, Veeam instructs the primary NetApp system (RLPEDGE01) to perform an array-based snapshot and subsequent orchestration. 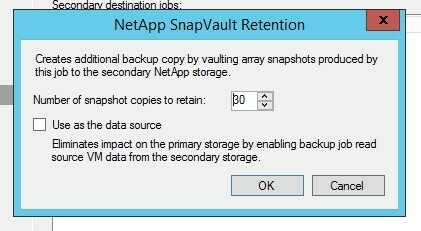 Next, the primary NetApp system will manage the SnapVault update to the secondary (RLPEDGE02) and retention policies of these snapshots within both primary and secondary systems. The NetApp ONTAP built-in protection engine handles the SnapMirror update between the secondary and the tertiary (RLPEDGE03) NetApp systems. Through this process, all snapshots on RLPEDGE02 will be mirrored to RLPEDGE03 and made available for restores. The customer benefits here by being able to leverage Veeam’s native restore capabilities on any NetApp ONTAP platform in the environment. This includes the third NetApp system, RLPEDGE03, which is not part of the Veeam snapshot orchestration process. The restore functionality permits granular restores using Veeam Explorers for Storage Snapshots to perform file, item or VM image-based recoveries for Microsoft Active Directory, Exchange, SharePoint, SQL and Oracle. Veeam OnDemand Sandbox capabilities can also leverage NetApp snapshots to create isolated test environments for testing application updates, patches and other changes, without impacting the production environment. If you require any assistance creating a Veeam/NetApp backup job, you can find additional detail in the Best Practices Guide. After Veeam Backup and NetApp SnapVault are configured and running, we can now set up the SnapMirror relationship to the third NetApp system. However, you should pair NetApp 2 and NetApp 3 and ensure that the proper SnapVault Mirrors (SVMs) are available and paired as well. In addition, create a DP Volume on the NetApp 3 SVM, which will be used as the destination target for the SnapMirror volume. NOTE: Veeam assumes no warranty for any command. These commands should only be used as a reference. Exercise CAUTION when working in any production environment. All commands should be modified (cluster, volume, vservernames, etc.) to fit in your environment! 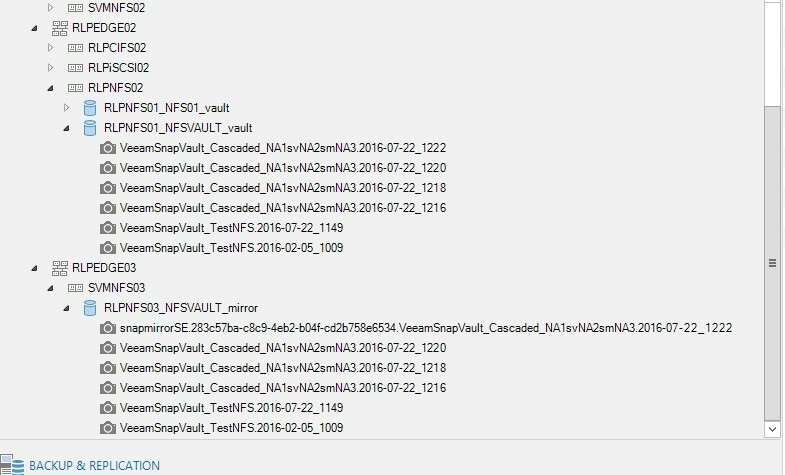 Now that the SnapMirror relation has been initialized and running (in our case, every 5 minutes), check the Veeam interface to verify that snapshots on the third NetApp platform are available for restores. As you can see, all three NetApp systems are available, as well as the three volumes. When browsing the volumes on RLPEDGE02 and RLPEDGE03, we see the same number of available snapshots (one snapshot is the baseline image). With the configuration complete, we now have a cascaded SnapVault to SnapMirror relationship from which all Veeam restore capabilities can be used. One of the benefits of the direct integration Veeam provides is the ability to directly restore from array-based snapshots. 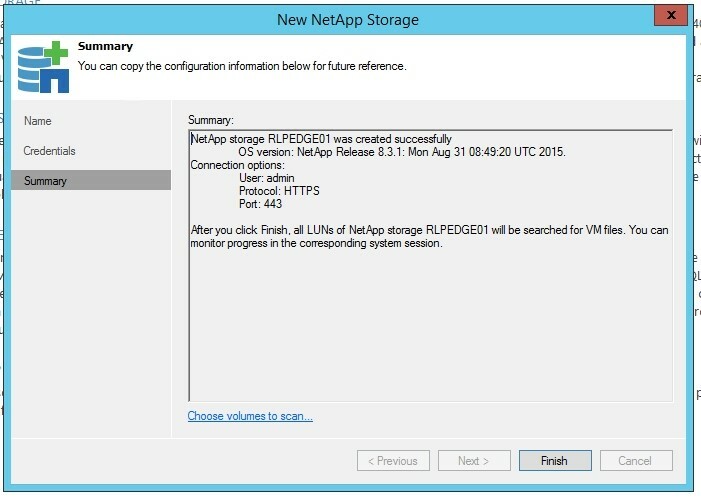 In the example below, we illustrate how an administrator can browse our NetApp system RLPEDGE03, view the VMs within that snapshot and perform all of the great recovery options that Veeam has available. In summary, this scenario illustrates how we’ve executed a single NetApp snapshot, which has been cascaded down to our tertiary device where we’re able to perform recovery. This process drastically reduces the load placed on the production environment during backup and recovery operations, which in turn, increases the RTPO for our applications and services. What about Veeam Backup from Storage Snapshots? Veeam Backup from Storage Snapshots is a unique technology that optimizes VM backup by leveraging Storage Snapshots as a source for the Veeam data stream. In the scenario that was just explained, you can fully leverage Veeam Backup from Storage Snapshots from the primary or secondary NetApp ONTAP storage device. Veeam orchestrates all the snapshots processes across these two storage systems. To complete the cascade process, and as mentioned earlier, the SnapMirror relation toward the third NetApp ONTAP system is handled by the data protection engine of ONTAP, and is not a part of Veeam orchestration.